The Best Eating Habits for Kids, Picky Eaters Included! I believe these steps, along with creating a no pressure environment, are the foundation to getting your child (picky eater or not) to eat well. These are the strategies I often give parents when I walk into their home for the first time, and when families are able to make these changes, which can sometimes be challenging, I see the most improvement. As a mom, they have helped set the stage for both my sons feeding skills, and I notice very quickly that when I deviate from these rules their eating suffers. In those instances, I get back to these basics, and it works! 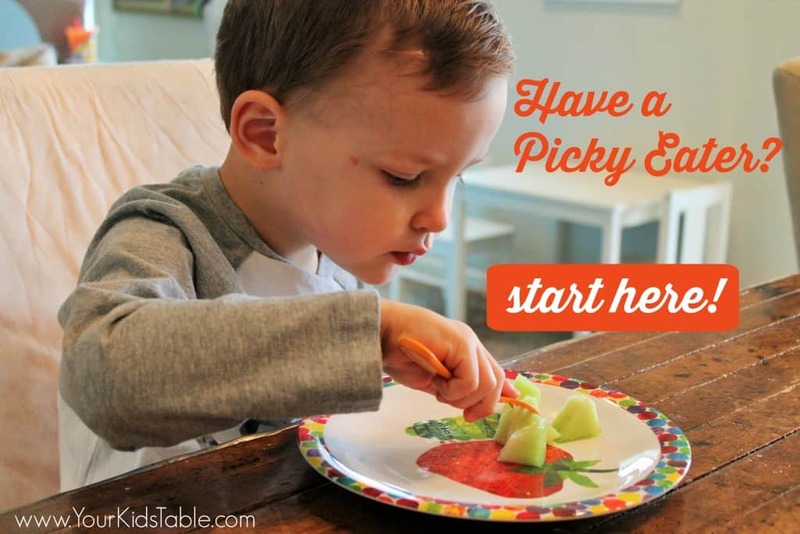 For the parents of picky eaters, I wish I had some quick trick that would solve “picky” eating. I know that feeding your kid can be the most stressful time of day. If the following strategies seem overwhelming, then think about implementing them in small manageable steps, one at a time. My best advice is to stay consistent and to keep trying!!! I will help get you there! Meals are a social experience and we learn from what we see. You know, monkey see, monkey do? If you expect your kid to eat something new, how willing will they be if you aren’t trying it too? Kids, especially babies and toddlers, may actually watch how you bite and chew a new food, using you as a model for how they should proceed. It also sets a standard of eating, meaning your kid will grow up knowing that vegetables (or whatever else you are eating) are healthful and part of a normal diet. I am not saying that all kids will see Mommy eating spinach and thus eat spinach, but it is the first step in setting a good foundation for a diet with more variety. Another advantage to eating with your child is that you can talk about the color and texture of the spinach (without pressuring them to eat it,) which might happen if you are distracted by unloading the dishwasher. Check out 5 Fun Ways to Grow Closer to Your Child During Dinner for more tips. Okay, be honest with yourself, how often does your child actually sit down at a table to eat their meals (no judgement here from me)! Our culture has become so hurried that it’s very commonplace to set out a plate and let our kids eat while they play (aka grazing) or pass through a fast food window and eat in the car. However, in these types of scenarios, kids are distracted and the message that’s being sent is, “eating isn’t that important.” There are situations where this is inevitable, such as traveling and parties, outside of that I would strongly discourage it, at least on a regular basis. If you need to start small (baby step) use a pop up card table or a coffee table at first, but work towards Turning off the TV. A small kid’s table is fine too, just make sure you are going to sit at it with them. Not that you need to go invest in a bunch of stuff, but some kids respond really well to unique and playful utensils, plates, and other tools you may not know about! Get inspired at Fun Plates for Kids. Spacing meals apart is critical to your child being a good eater, I really can’t stress how important it is. Unfortunately, nobody tells parents that kids are suppose to eat every 3 hours with NOTHING in between but water. Kids like to graze and snack throughout the day, which on the surface seems fine because at least they are eating. In reality, they are eating just enough to suppress their appetite and then don’t get hungry enough to eat a meal. Juice, milk, or cheerios are enough to fill their little bellies up, so save the other drinks to have with their meals. I have seen the greatest improvements in kids eating when families strictly adhere to this. You don’t have to follow this exactly, base it around when your child sleeps. Generally, have them eat about 1/2 hour after waking up. My son may take a three hour nap most of the time so that afternoon snack may be a little longer of a stretch. If your child sleeps later in the day, it may make sense to have a morning snack. Maybe they take a short nap or don’t take one at all, then a morning and afternoon snack might be more appropriate. Of course, a bedtime snack could work as well. I am going to keep this short. Please don’t hold your child’s mouth open and shove a fork into it. I know you just want them to try it because if they do they will love it, but it creates so much negativity around meals that your child will start to avoid them altogether. Forcing them to eat also makes them distrustful at meals. They feel like they have to be on guard and are thus defensive, which means they will eat less. Most simply though, it isn’t very nice. If you have already done this, it’s okay, just don’t do it again, and let your kid know that. Stand behind your word and you will start to build some trust and make some progress. There is never a situation, no matter how dire when this is appropriate. If your child will only eat with force feeding I would very strongly suggest scheduling a feeding evaluation, immediately. Children take in so many of our nuances and behaviors, the good and the bad. They see your reaction when you have a bite of broccoli, or if you even put the broccoli on your own plate. If you don’t like to eat certain textures or have a limited diet, your child will pick up on it. They notice and will repeat the disgusted face you made when you tried a bite of the broccoli or if you didn’t take any of the broccoli. This sends a very strong message to them: you can pick and choose what you want to eat and some foods taste gross. Try to put aside any food issues you may have and at least stay neutral about the food if you can’t be excited about eating it. Also, consider if you are limiting the foods you expose your child to because you don’t like them. Just because you don’t like mushrooms, doesn’t mean your child won’t like them. In fact, you are doing them a disservice by assuming they won’t like it… I know the thought process doesn’t even get that far usually. You may not even think to buy the mushrooms because you don’t eat them. Think outside of the box a little when planning your meals, is there something else you can all try together? Just remember to be conscience of your attitude and personal response to the food. I know it’s beyond frustrating when your kid doesn’t eat what you put down in front of them, especially if you had them in mind when you were making it. It is hard not to lose your cool when they push the plate away, start to play with the food, or try to get out of their chair. As a parent you start to add up what they have already eaten that day and maybe it was’t so great. Maybe they are tantruming, cranky, and you know that if they don’t eat something it is going to be a long night. In some cases, parents are worried about weight gain and if the kid doesn’t eat, they aren’t going to put on weight. I know it is so tempting to open the fridge and say “What do you want?” or to reach in the cupboard for the easy mac you know they will eat, but I would encourage you to take a deep breath and collect your thoughts. How do you really want to proceed? If you give in and get them a preferred food or something they requested, you are reinforcing the idea that they don’t have to eat what you are serving. I can almost guarantee you that the next meal you put something in front of them, they will do the same thing to get what they would rather eat. Think about it, as adults we know it’s not healthy to eat easy mac every night, or at least we should, but children don’t have self control. It is our job to teach that to them. Ultimately, I think it is more frustrating to start cooking multiple meals when you have already put the effort into the one that is front of them, and now your cooking again instead of eating together as a family. Your kitchen is not a restaurant, don’t let you kids think it is one. Learn more about how to make one family meal work, with even the pickiest of eaters. A preferred food is something your kid likes and consistently eats well, this is the kind of food you can count on. Some kids only have a few foods they consistently like. If that is the case, then you may want to broaden what you consider preferred to also include foods they eat at least some of the time. When you give your child a meal, have at least one food on the plate you know they like. This frees you up to give some other foods that may be non-preferred or new because you know that at a minimum there is something they will actually ingest. This principal goes hand in hand with principal 6, and should make you feel more comfortable about not resorting to short order cooking. Corn, green beans, noodles, ham, cheese, and shrimp are some of my son, Sam’s, preferred foods. Cauliflower, chicken salad, hamburgers, and navy beans are some of his non-preferred foods. I know I am going to make hamburgers for dinner, which may be a struggle for him to eat, if he eats any of it at all. To offset that I would make green beans (not cauliflower), put cheese on his burger, and of course he would have his bun, which will help him feel more comfortable and thus more likely to try some of the burger. In this example, I gave him more than one preferred food, but you don’t necessarily need to, one preferred food at a minimum. While I have given you these really important guidelines, it is also very important that you head over to the Best Picky Eating strategy, if you haven’t already. This is all about creating a no pressure eating environment for your child, which will totally amplify the results when you apply these basics. Of course, each child is different, and I recommend giving these steps some time, for your child (and you) to adapt to a new routine before you expect to see major changes in their eating. But, if you pay attention, I bet you will notice some small positive changes. Give yourself a pat on the back for the baby steps, they are important and they add up to make big changes! Lastly, if nutrition is important to you and it’s something you want to instill in your kids, there’s a right and a wrong way to go about teaching them. Check out how to teach kids about nutrition so that you can help the grow to make their own healthy choices. This site is full of more strategies and in many of the posts I re-visit and expand on some of these same principals because I really do feel like they are the foundation to good eating habits. To see all of the posts in organized by topic click here or check out my Article Index in the top menu. This free workshop has dramatically changed many families meals… what can it do for yours? Is Your Child Eating Enough Variety?